“We are not at peace with others because we are not at peace with ourselves, and we are not at peace with others because we are not at peace with God.” – Thomas Merton. I used to think that peace was a lofty goal, unattainable by human standards. The peace that passes all understanding that is revealed in Philippians 4:7 seemed somewhat like a prize to be earned, a trophy to win, or perhaps an honor to be awarded. I didn’t understand it. I didn’t know how to get it. I really didn’t know if it was allowed. Peace was illusive to me for so long. I strived to fit in, to do things correctly, to say the right words and to wear the right clothes, thinking that would usher in a sigh of relief. But that didn’t work. Something was usually not right, or not enough. That feeling of ‘not right’ it is a heavy burden to bear, and it is a lie, we believe too much. We miss out on peace because we don’t know our own value or that we don’t have to work to be accepted. I learned years ago, though, that all Truth is found in one place… in ONE person, Jesus. John 14:6 reveal some precious red letter words for us to ingest and meditate on repeatedly, ” I am the way, the truth, and the life: no one comes to the Father, but by me.” This truth… this is the door that opened my journey into understanding the power of a life that has the seed of peace planted within. And while Christ is fully enough, I learned, that the wounds and the scars we wear, whether self-inflicted or not, tend to make the journey a little more difficult when we don’t understand the way of a peace-filled life. Discipleship is a journey, a traveling that can be tedious at times and shockingly bold and complete at others. I never learned how to process some of those feelings that settled due to life and loss and grieving. It was a stumbling block for me when it came to understanding what joy looked like and how hope prevailed and where peace floods like a river, when I let them. Yet, I chose to pursue the study of grace, the passionate seeking of this favor of God that leads us straight to the mercy seat of Christ and unfolds the power of a life that bleeds love. And those choices led me to understand more and more that peace was a place we all belong. Because God is always good, He is always working our behalf to bring us into that place where the His presence is the joy that overwhelms us and leads us to be full of that overflowing peace which restores, redeems and rebuilds our hearts. “I have a Heavenly Father, who will walk with me and work with me while I slowly, deliberately find and rebuild the foundation of my true self” – Lisa Murray, Chapter 9, Fostering Authenticity, Peace for a Lifetime. And God meets us on the journey in so many merciful ways by bringing others who have a gift of knowing The Way and showing you how and leading you in to that place of redemption. When someone knows the redeemer, intimately and truly, when they know how to share the truths that they themselves have learned, it is God’s mercy when they come into your lives at just the right time. There are 3 sections in Lisa’s book: Peace with God, Peace Within, and Peace with Others. I dog-eared, post-it noted, underlined, and summarized each and every section. It really looks like a party is going on inside the pages with all the colors and waving tabs hanging out. I have read through the book, made notes in my journal, and even had to go back and re-read a few portions that sort of sifted by me as I tried to devour the wisdom within. I have loved them all, but I have to say that the 2nd section, Peace Within, was the one that spoke to my heart the loudest at this time in my journey. It could be that this need to lay down the banner of self-preservation and perfectionism has become my very real here and now, or perhaps it was just one more stop on the journey of releasing everything to the Lord. Each chapter starts with a fantastic quote, and of course the word-nerd in me has to copy them down. They are that good. Chapter 9, focuses on Fostering Authenticity, and the beginning quote is from Anna Quindlen, “The thing that is really hard, and really amazing, is giving up on being perfect and beginning the work of becoming yourself.” Although I was learning such value from Lisa’s wisdom throughout the previous chapters, I do believe this was the one that I was supposed to take time and rest in a while. Looking back through the chapter I found a spot that I underlined and summarized repeatedly. One of those places is where Lisa encourages us to take the risky journey of going deep within yourself to find who you really are. She says, “Somehow in our efforts to be what everyone else thought we should be, we miss out on discovering ourselves, who God created us to be.” (p.103) And my summary on the side is: Lack of Authenticity robs us of God’s Best. She goes on to encourage us to invest in ourselves by taking the journey of discovering who we are IN Christ. She reminds us that the journey is absolutely necessary because you are beloved. 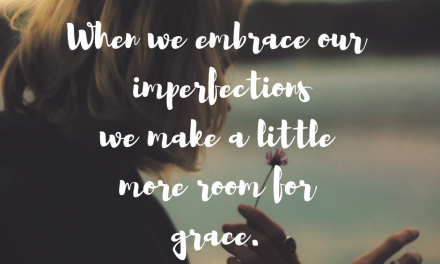 She reminds us to give ourselves permission to be imperfect by living fully in the identity of one who is beloved by God. This investing is a tool that helps us lay the foundation of peace in every area of our lives. The book is a literal guide that helps you create a safe space to uncover the lies that rob us of authentic living and leads us to live lives that are repositories of peace so we can start embracing our own authenticity and stop running from who we were created to be. Throughout the entire book Lisa reminds us that the goal is what she defines, Emotional Abundance, or EA. It is like a virtual therapy session with Lisa, one-on-one, as each page takes you on another journey of discovery and revelation. It is certainly not a book you will read, put down and walk away from. It is one of those that you will read, read, and read again, because it is full of truth and it is worthwhile investment in yourself and in those you love. It is a lot like mining gold… hard and sometimes dirty and messy, but invaluable and priceless when you find it. Lisa closes with this verse from God’s Word, which is the seed of truth for our hearts, reminding us that …”Life is not a destination, but a journey”… towards peace and the One who purchased that peace for each of us. Praying for your hearts to be filled with that peace that passes all understanding today, that you will know you are beloved and perfected by His love, yet gloriously beautiful in your imperfections because you are His. Lisa’s Book is Available now! Peace For A Lifetime by Lisa Murray Video Trailer from Lisa Springer Murray on Vimeo. Dawn, what a lovely review of this book! I love the book just as much as you do. Lisa’s words are powerful. Oh, thank you for such affirming words, Crystal, and thankful for your visit. Thanks for such a great review. I can’t not read this book after reading this and seeing your gorgeous images. I’l still chewing on the Anna Quinlan quote! I am still smiling about that post you wrote about schedules and planners. In fact, I got my planner out after that and dusted it off. 🙂 ha! No, actually, I had to find a note I put in it last week when I dusted it off and then set is aside. Ah, there is hope for me yet. Self-imposed time outs.. Sister, those are like vacations for mom, right?! The kids just think we are punishing ourselves. Seriously, this book Lisa wrote, it is worth the investment and more. You absolutely won’t regret it. So glad you were here today!